People in the affordable housing field have grown increasingly interested in talking about healthcare. Concepts like “housing as a platform” for health outcomes have become part of our professional lexicon and panel topics at our conferences. We talk a lot about the barriers to progress in aligning health and housing policy in this country. We also talk about integrating service delivery and how to cut through the red tape and silos that divide health and housing systems today. It turns out that health policy advocates are just as eager to talk about housing as we are to talk about healthcare. I witnessed this firsthand at the annual National Association of States United for Aging and Disabilities (NASUAD) conference on home and community based services, which brought state health policy staff, practitioners, and advocates together to talk about the latest in community-based healthcare policy. As a housing policy person working for a housing organization—the Housing Partnership Network (HPN), a network of the country’s strongest housing nonprofits—I wasn’t sure what to expect from a conference held by and intended for health policymakers and professionals. However, after listening to panelists from the healthcare field talk about housing as a key factor in the future of their work, it became clear to me that we’re not the only ones who are working hard to connect housing and health in our communities. It shouldn’t be news to anyone that housing and health are inextricably linked; indeed, we can point to a growing body of evidence proving that safe, stable, and affordable housing is a key determinant of health and well-being. In the housing field, we’ve learned that our mainstay public programs like Section 8 housing vouchers, project-based Section 8 housing, supportive housing for the homeless, low income housing tax credits, Section 202 housing funding for seniors, and Section 811 housing for people with disabilities all work best when they are supplemented with health, wellness, and childcare services. At the NASUAD conference, I learned that our colleagues in the healthcare field are also talking about housing and healthcare, often in surprisingly parallel ways. Historically, Medicaid and Medicare funded long-term care for people with chronic conditions and disabilities have been institution-based—think nursing homes and hospices. Over the past 20 years, however, this care has gradually shifted toward services based in communities. This movement has been driven by a few different factors. For one, many disability advocates have made equity and rights-based arguments promoting community living for people with disabilities instead of segregation in institutions. They have also pointed to cost-effectiveness, since community-based services cost less than institutional care The shift to community-based, person-centered (as opposed to regimented or one-size-fits-all) care for people with chronic needs was reinforced by the 1999 Supreme Court Olmstead decision, which cemented the right of people with disabilities to receive support in the most integrated setting possible. Amid this change, health policymakers have discovered that the biggest obstacle to providing long-term care in communities is a persistent shortage of affordable housing—something we’re all too familiar with in the housing field. Currently, rent and cost of living expenses are eligible for Medicaid coverage when a person lives in an institution, but not when they live at home or in their own apartment. This imbalance makes independent living all but out of reach for people with disabilities or the frail elderly, who for the most part earn extremely low incomes or live on limited Social Security payments. There’s broad acknowledgement that we need to expand the supply of affordable housing with supportive services, but less consensus about how to do it and who should be responsible—especially when it comes to funding and resources. Just in the last few years, we’ve seen unprecedented collaboration between HUD and the Department of Health and Human Services, two agencies that until recently weren’t known for tackling issues beyond their immediate reach, in part due to the Obama Administration declaring 2010 the “Year of Community Living.” Today, the agencies are working together to initiate collaborative projects between state health and housing agencies. One of these projects has involved reforming HUD’s 811 program, which originally helped housing developers with construction and ongoing funding of housing units for people with disabilities. The reformed 811 program requires state health and housing agencies to collaborate on a big-picture plan for coordinating housing and services for people with disabilities—a major step toward creating a more effective health and housing infrastructure in communities. What’s more, the 811 program isn’t the only major collaborative project—HUD and HHS have also worked together on programs like Money Follows the Person, which helps pay for housing and services for people transitioning out of institutions and nationwide meetings with state housing, health, and services officials. At the NASUAD conference, I heard from state health policymakers and professionals working with these programs on a day-to-day basis. They were all in agreement: the programs are succeeding at connecting health and housing agencies in the policymaking and implementation process, in many cases for the very first time. They all agreed that collaboration is most effective when there’s a specific program or policy to work with, and that learning the language of one another’s programs is a key step. HPN’s high-capacity nonprofit members are also on the front lines of the effort to connect health and housing in communities. 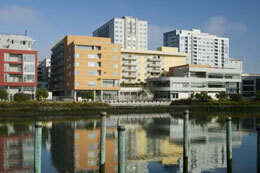 In San Francisco, Mercy Housing California worked with the city’s health and housing agencies to develop the Mission Creek Senior Community, which provides affordable apartments and supports to former residents of the city’s shelters and public nursing homes. Also in San Francisco, the Tenderloin Neighborhood Development Corporation is working with state and local health agencies to create supportive housing with health services for formerly homeless individuals. Finally, National Church Residences has pioneered an innovative approach to housing seniors in Columbus, Ohio who would otherwise be in nursing homes, using Medicaid waivers to pay for services and supports in community-based homes. For all the progress we’re seeing, there’s still a long way to go before we see deep integration of our health and housing systems within communities. This is partly due to the independent nature of our delivery systems for social services—from the federal government down to local communities, our housing and health systems were developed separately and have evolved separately. There are still strong voices in both systems that believe this is how things ought to be—housing agencies should create housing and health agencies should provide healthcare, and never the twain shall meet. It is clear that bringing the two systems together is a long process that will need to withstand political headwinds and shifting priorities. That said, the stage is being set for major changes in our healthcare system, and making those changes sustainable and successful will require a renewed focus on affordable housing for families, seniors, and people with disabilities. Policymakers, professionals, and advocates from the housing and health fields can advance this agenda by seeking opportunities to share knowledge and collaborate, at our meetings, in our conferences, and through our advocacy. With many small moves of the dial, we can bring our communities closer together.